Will the Dishes of Downton Abbey Soon Include Those of Liverpool? Viewers worldwide gasped when the plot of Downton Abbey took a tragic turn and the kind Lady Sybil suddenly died in childbirth. Left behind is her Irish husband, Tom Branson, the former chauffeur to Sybil's father, Robert, the Earl of Grantham and a small baby girl. To say the least, Branson's character is that of man caught in the contradictions of the changing age. He longs to be free of the constraints imposed by British policies yet he is, by his very struggle against it, part of that tradition - so much so he secretly loves and marries the young Sybil, whose own family represents the very heritage he rebells against. On her death, he is lost, adrift in an elite family foreign in its tradition to all he knows and values. He is Catholic; they are members of the Church of England. He has worked his whole life; their wealth has protected them from the daily grind of labor. He has been their servant; they expect to be served. The only bridge between these two vastly different worlds is one small baby. Yet Tom, supported by the younger members of the Crawley family, desires to leave the Abbey and rebuild his life as an auto mechanic in Liverpool with his daughter by his side. Time (and future episodes) will reveal if he is successful. But if he does go to Liverpool, he will find a world stunningly different from the green meadows and quiet forests of Downton. It was (and is) an industrial port city full of sound and motion, commerce and change. Even the regional dishes enjoyed there tell of a practical people grounded in a hardened reality so different from the genteel estate atmosphere of Downton. Perhaps the most outstanding example of this is scouse, a hardy stew. Made from either lamb or beef, it was first brought to Liverpool's tavern by sailors fond of their ship's food. The stew became so popular its name has come to proudly represent all those born in Liverpool down to today. 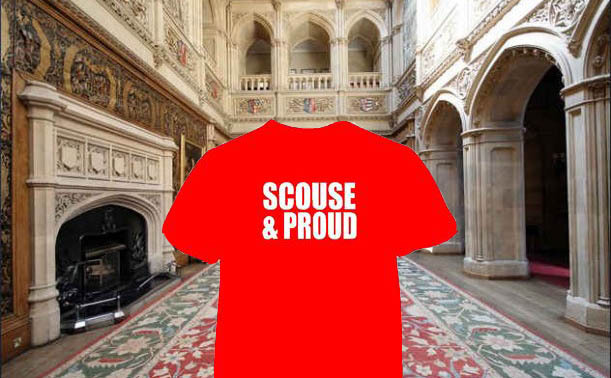 At football (soccer) and rugby matches, t-shirts are worn in abundance declaring "Scouse & Proud" while others wave signs that read "Keep Calm, Life Is Never Perfect but Being Scouse Is Close Enough". One can only wonder if little Sybil, who was named after her deceased mother, will develop such a strong personality if she does go to Liverpool to live with her father? Should make a great story turn, no? Posted on February 4, 2013 by Ana Kinkaid and filed under Cooking, Cuisine, Culinary History, Films, Food, Great Britain, Movies, Recipes, Sports, Taste and tagged Crawley Chauffeur Downton Abbey English Servants Femininism Football Lady Sybil's Death Liverpool Lords and Ladies Rugby Scouse Stew Soccer Tom Branson.